This song was a favorite of Billie Holiday. 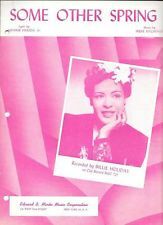 This song was composed by her friend Irene Kitchings, wife of bandleader Teddy Wilson. “Some Other Spring” was recorded in June 1996 and released in 1997 on the album Tony Bennett On Holiday. It was arranged by Jorge Calandrelli.